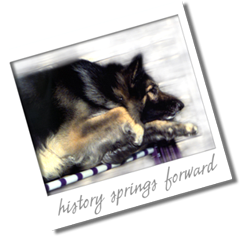 Another landmark in history - CJ's LeFemme Nickita, CGC, TDI, owned and trained by Marilyn Bartolone, has recently become the FIRST Shiloh Shepherd to achieve certification with a specialized therapy program known as R.E.A.D - Reading Education Assistance Dogs! CONGRATULATIONS! Nick has recently become the first Shiloh Shepherd to achieve certification with a specialized therapy program known as Reading Education Assistance Dogs. R.E.A.D. was originated by Intermountain Therapy Animals which is an affiliate of the Delta Society. Currently, the program is in the early stages and only 745 dogs have been selected to participate. Their mission "is to improve the literacy skills of children through the assistance of registered Pet Partner Therapy Teams as literacy mentors." Nick and Marilyn are working with children who have difficulty reading as well as children who have special needs. R.E.A.D. also has been successful for children dealing with family problems. Nick was never raised with children and yet she displays a gentleness that is inherited by good genetic breeding. Her sire was CJ's Lobo De Amado De Windsong and her dam is CJ's Azucar Y Diablure De Lobo, her breeder is Judy Vaneman. Nick is only 2 years old and has already earned her CGC and TDI. Marilyn explains they attended a concentrated workshop to prepare for the R.E.A.D program. She says, "Nick got lots of attention at the Library on their first session! All the children wanted to read to her!" 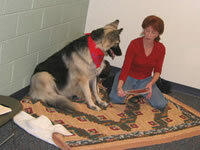 All dogs being carefully screened for Animal Assisted Therapy work must demonstrate many specific qualities.